Gone are the days when your ears were left out of the wearable equation, with the hearables scene growing rapidly right now. Not only have the likes of Apple and Samsung released smarter earbud options, but smart earbuds like the Bragi Dash and Doppler Labs' Here One are taking this space forward. 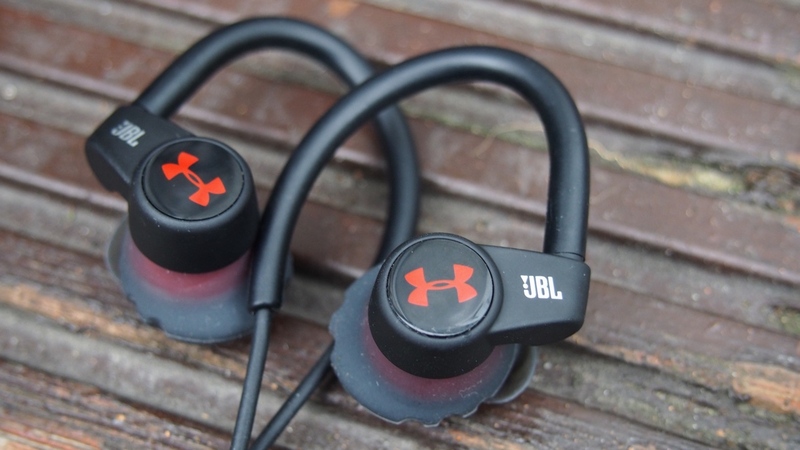 Looking to get in on the action is Under Armour's Sport Wireless Heart Rate headphones — a smart version of its standard, dumb sibling — which are still powered by the folks at JBL. The in-ear headphones track heart rate in real-time and also provide a mix of standard and exclusive heart rate based metrics to make it a useful workout companion. But do these biometric tracking 'phones cut it in the gym and out running? We put them to the test to find out. Despite the Sport Wireless HR's tracking smarts, there's no real indication they're anything other than just another pair of headphones. As you'll have already picked up, the headphones feature a hook that goes around your ear to keep them in place. This is probably the biggest difference in design between the Wireless HR's and its rivals, such as the Jabra Sport Pulse. And it goes without saying that this isn't as neat an option as simply popping in a pair of buds, but we're happy to report that this doesn't weigh down your ears, and actually serves as a solid addition to keep the pieces in place and the all-important heart rate connected. To keep the wire behind your head from flailing all over the place there's a small a clip can be attached to the top of your workout gear. To get the ideal fit it comes with four different ear tips. These are not designed to sit deep — think of it more along the lines of Apple's AirPods. The headphones never shift about in your ear, and this doesn't affect sound quality (which we'll explore later). As for controlling the action, this can be performed through the inline remote sitting on the wire, which holds volume controls and a play/pause button. It's all pretty standard fare here. The remote also hides away the microUSB charging port and an LED light indicating when you are at full power. A microphone is also built in so you can handle any phone calls mid workout or when you've finished up at the gym. We wish there was a way to pause workouts without having to pull out your phone — not ideal for when you're at traffic lights on a run — but being able to simply tap the right earbud for an update on your heart rate is responsive and simple at least. You're not getting these headphones to measure your cadence or for any VO2 Max feedback, but what Under Armour does bring to the table is heart rate monitoring. We tested their tracking skills primarily against a Polar H7 chest strap — which we consider to be the peak of heart rate accuracy — but also wore an Apple Watch Series 2 for some extra glances. Depending on your settings within the app, you can receive feedback on your pace, average heart rate and current heart rate between a range of minutes, and also tap that right ear for instant readings on your current beats. Let's use the outdoor run below as an example of how the headphones perform pretty regularly. Essentially, it's okay, but not without issues. As you can see, both devices were able to lock onto heart rate pretty quickly, while also recognising the initial drops for traffic. But when looking at the breakdown of different heart zones, the headphones consistently struggle to recognise the higher end. While the chest strap and Apple Watch were able to stay within two or three beats of each other when hitting the top tier, the Sport Wireless HR's seemingly underreported our heart rate. This is also reflected in the after-run data for of average heart rate, which the headphones notes was 159bpm. The chest strap and watch, meanwhile, both listed this as 168bpm. It's a similar story on the treadmill, which, although not the ideal place to measure distance, does provide what should be a steady and consistent comparison on your ticker. Again, as shown below, the UA headphones are unable to negotiate heart rates at the highest level. While the chest strap is able to pick up on action crossing 178bpm, as was the Apple Watch when we looked down, too often we found the headphones sitting slightly behind and stuck in the fourth zone. The line between the two highest zones is fairly slim here, which is likely why the headphones accounted for 60% of the workout being in the anaerobic threshold, but generally this always felt off the pace of the other devices when the going got tough. It's certainly not a car crash of a performance and on the whole this was around 3bpm out from the other devices we put it up against. You'll be tracking your activity through Under Armour's Record app, which also acts as your hub to track nutrition, sleep and your daily calories and steps, whether you're doing your work through iOS or Android. But while the app itself is solid on paper, having to actually use your phone is one of the big downsides here. Although, for example, the Record app is available on the Apple Watch, it's not able to just use the device's in-built GPS and music storage to allow for a phone-free experience. Using a phone is common for most and the pieces are there to create a more streamlined experience. The app is fairly comprehensive, though, and is actually simple to navigate despite the wealth of options at your disposal. You're able to track your heart rate and location through pretty much every kind of gym workout — from your core and upper body to the stair machine and elliptical. That's providing you can connect the headphones, that is, as we encountered consistent issues. When setting up to begin a workout, you're shifted onto a screen which allows you to connect to the phone's GPS, adjust audio feedback, set goals for the workout. However, once you select the headphones as your heart rate source and tap back to begin your exercise, you'll be told you've been disconnected. We found that the two eventually shake hands when staying in these menus for a longer amount of time, but this is far from seamless, and does leave you standing around getting cold before a run. As for post-workout metrics, you'll be greeted with an average intensity percentage and Under Armour's own WILLpower rating. This, on a scale of 0.0 - 10, will score you how hard your body has worked in a single session, taking into account the length of your workout, body position, your user profile, heart rate information, ventilatory threshold, recovery rate, activity level and dynamic changes within your heart rate. This is one of the stronger points of the app, in our view, and one that matches up favourably with how a workout went and the various stats you've compiled. However, there's still more potential to be unlocked through the heart rate monitoring, as we've seen various biometrics and VO2 Max training included in rival headphones. When it comes to GPS accuracy, the app can usually match up with other devices fairly strongly. There have been a couple of instances when the total distance has been overstated, but this is never anything over 0.3km. While the smart metrics and feedback is all well and good, it means little if the headphones don't sound good enough to assist you on runs through busy streets or blur out the consistently mind-melting gym music. We were very happy with the sound we received from the Wireless Sport HR headphones. There's always the fear that some of the tech can get in the way of the playback quality, but you'll consistently find strong bassy sound and solid noise isolation. You'll likely have to crank your volume all the way to the top, but that isn't too uncommon when dealing with audio over Bluetooth. One of the biggest compliments we can pay the headphones in this area is that they are up there with the Jabra Sport Pulse earpiece, which are some of the best sounding smart Bluetooth headphones out there. We've found the battery to be hit and miss during testing, but thankfully early issues were able to be resolved relatively simply. During the first two runs with the pair, in which we started out with at least 90% battery, we were hit with battery warnings after around 45 minutes. Not ideal. But after tinkering around with different settings, we were able to rectify the issue. Now an hour of use with heart rate won't even take 10% off the overall total, leaving us confident we could use the Sport Wireless HR on bigger runs and also that Under Armour's claim of five hours battery is about right. The Under Armour Sport Wireless Heart Rate headphones provide strong sound quality and a comfortable fit for those looking for something for the gym or their runs. But while it surpasses its rivals in this area, the smarts just aren’t up to the same level. Heart rate monitoring isn’t as strong as its competitors, and this is only compounded by a lack of metrics for serious athletes and having to piggyback GPS from a smartphone.